February | 2008 | FreshTech. This mynbks instructions were written by “iamnohs” in the Amazon Kindle users forum. Open up the BasicWeb browser on your kindle. At this point you can search, browser, or enter a Book ID. Find a book you want. KEY STEP: Click on the Mobipocket version of the book for download. ONLY THE MOBIPOCKET VERSION WILL WORK. A pop-up screen will open on your Kindle. You supply the confirmation for the book to be downloaded, and in a few seconds it should appear in your home screen. “Kindle” format (.azw) is also available as a desktop download from manybooks.net, to be transferred to your Kindle via USB. 2) Log on to Manybooks.net on your computer. Tips For Getting The Best Out Of Your Sony PRS Series of Electronic Readers. To rotate the display, simply hold down the “Size” button for about 5 seconds and the screen will rotates from portrait to landscape and back. To jump 10 pages forward or backwards, simply hold down the “Page Forward” or “Back” button for five seconds and the page will jump 10 pages in the direction of the button. For the PRS-500: hitting the number “1” button will bring you to the start of the book you are reading. Hitting the number “2” brings you to 20% of the book, the number “3” to 30% and so on…So if you want to open to about half way in the book simply hit “5”….get the picture? For the PRS-505: You can type out the page number you want to go to using the number buttons. Once you have entered the correct page number hit the enter button on the lower right side of the Reader (in the center of the arrow buttons). If you make an error you can hit the “menu” button to exit the go to page feature…you can acutally do this with Kindle as well. You Can Make Your Personal PDF Documents Look better On the Reader. Most PDF documents are formatted to fit an 8 ½” x 11″ piece of paper and not a screen the size of the Reader.The Reader will have to resize your files to display on its screen. This may affect the appearance of the document on the screen…but there is a way out. You can reformat your PDF files so that they look better on the reader, Click here for details. The PRS-500 Reader supports Memory Stick Pro or Duo (with adaptor) up to 4GB. And it supports SD memory cards up to 2GB size. It is important that if you use a Memory Stick Duo that you use a full sized adapter. The PRS-505 Reader supports Memory Stick Duo up to 8GB. And it supports SD memory cards up to 2GB size. It is important to note that this reader does not accept full sized Memory Sticks or adapters. It’s best if you use the supplied PC Software to import and transfer files to the Reader, as it will enable faster page turns and re-sizing on the Reader itself. You may also import Microsoft Word files to the device with the software. The supplied software will convert the Word document to RTF during the import process as long as the user has Microsoft® Word on the PC. Q: can kindle display fonts in other languages? A: Not yet, give it time and it will. Q: How much reading can you get out of a fully charged Kindle battery? A; Amazon claims one week, but in reality, it really depends on the number of page turns you make. The larger the font, the more page turns and the shorter the battery time and visi-versa. I get just about 4 days on a size 2 font reading at about 2- 3 hours a day. Q: Can you increase the Kindle memory? Q: Can you organize books that you download on the Kindle Homepage? A; Not yet, as of now Kindle books are organized in the order it is downloaded and read with the last downloaded content or the one currently being read taking turn at the top of the list. Q: Do you need a screen protector for Your Kindle? A: You have one in the form of the Kindle cover, if you look carelfully at it, you will see that it is design with a cushion which protects your Kindle screen. Q: What do you do with books after you read them, Can they be transferred to another kindle? A: Yes, if it’s an Amazon book and the other kindle is registered under the same account (up to 6 Kindles on the same account). No, if the other Kindle is registerd to another account. If its a free ebook with not DRM rights, you can freely transfer as you wish. Q: Does Kindle work overseas? A: Yes if you load it up with content before you go. No, if you want to get your content wirelessly overseas – two problems: no whispernet coverage and ebook copyright problem. The following is a detail comparison between the Hanlin eReader V9t and kindle. Touch panel – equipped with stylus for textinput and easy navigation. Download content directly to PC. Use USB cable to transfer content from your computer to the ereader. It is therefore assumed that any content that is accessible on your computer in compatible format can be downloaded to the Hanlin ereader V9t via USB cable. Note – there are numerous content sites available on the internet, some paid others free. Display: Hanlin V9t – much larger display than Kindle(10 inches vs 6 inches). For the most part, both devices use the same electronic paper display. However, there is mention that the Hanlin V9t has an associated brightness that allows easy viewing indoors and outdoors – curiously not the normal view that we expect from the e-ink display. Hanlin – Assumed needed for content download on Hanlin V9t, since there is no mention of wireless capability. Kindle – Needed only when not in wireless coverage area. Kindle offers additional storage up to 4 GB via SD expansion cards. Hanlin V9t offers expansion up to 2 GB. Hanlin – No mention of content. It is assumed that content can be download from computer from various sources as long as it satisfies the compatible formats. Supports multi-level directory management to be used for book management and classification. When compared to the Kindle, the screen for the Hanlin v9t is much larger, it offers less compatible formats, holds less books, and does not offer wireless capability. In addition, there is no mention of a content source. – It offers up to 2 GB of additional storage capacity compared to 1 GB for the V9t. All other features remain equal. The following is a detail comparison between the Hanlin eReader V9C and kindle. 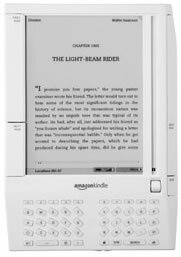 It is therefore assumed that any content that is accessible on your computer in compatible format can be downloaded to the Hanlin ereader V9C via USB cable. Display: Hanlin V9C – much larger display than Kindle(10 inches vs 6 inches). For the most part, both devices use the same electronic paper display. However, there is mention that the Hanlin V9C has an associated brightness that allows easy viewing indoors and outdoors – curiously not the normal view that we expect from the e-ink display. Hanlin – Assumed needed for content download on Hanlin V9c, since there is no mention of wireless capability. Kindle offers additional storage up to 4 GB via SD expansion cards. Hanlin V9c offers expansion up to 1 GB. When compared to the Kindle, the screen is much larger, it offers less compatible formats, holds less books, and does not offer wireless capability. In addition, there is no mention of a content source. I don’t understand the reason for this device since it is almost identical to the V9. One would think that, for another version, there would be some noticeable difference. If there was, I didn’t see it.